Open up your jewelry box and let the fun begin! A beautiful oval diamond ring with a custom halo and matching custom wedding band. Every girl dreams of the day when their true love will pop the big question and the beautiful custom engagement rings they’ll be showing off once they say YES! And that’s where I come in. Or should I say “we”. My name is Beth Cevasco, and my husband, Scott and I own Scott’s Custom Jewelers, in Akron, OH and Columbus, OH. We specialize in helping guys get it just right when it’s time to pop the question. First, a little background. In 2000, after working for “the family” for about 5 years, we founded Scott’s Custom Jewelers in downtown Akron, OH as a typical mom and pop jewelry store. 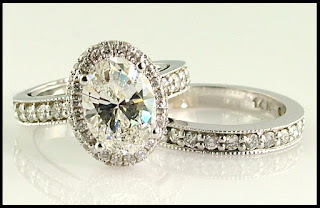 We sold diamond engagement rings and pre-made jewelry, but Scott has always been a creative soul, and he specialized in restyling customer’s jewelry into new, more updated designs. Besides, the jewelry we were buying was being made out of the country, and quite frankly, was falling apart. And since we felt we had to guarantee our jewelry, we were stuck. So – several years later, we invested in CAD (computer aided design) technology. This was mainly used by manufacturers, but Scott and I had a vision. We saw our store evolving into an appointment-like setting (kind of like a hair salon) where we could merge technolgy and art into a personal experience for our customers. In our dream, we would have customers bring in their jewelry box filled with out-of-date rings, broken gold chains and ugly, hand-me-down jewelry. They would then sit with a jewelry designer who could guide the customer into an original, personal, OMG! type of custom jewelry creation. We’d use computers, 3D pictures and polymer models to make sure the customer would not be disappointed after the jewelry was created. We didn’t want unpleasant surprises – only gushes of happiness! And we wanted everyone to be able to afford custom jewelry. Because really, why pay big bucks for a designer’s name when YOU could be the designer! And you know what, that’s just what happened! Scott, (who not only is amazing at jewelry designs, but is also a rockstar of a husband) has became known in our area for his custom jewelry pieces. Over the past eight years, we’ve expanded our little jewelry store into a chain (albeit small, but a chain none-the-less) with four jewelry designers in both Akron, Ohio and Columbus, Ohio. In addition to custom jewelry designs, both stores feature original jewelry for sale, all designed and produced on the premises. We now stand at seven employees and have a state-of-the art manufacturing facility where all of our custom jewelry is made. But the best part of being a custom jewelry store is the stories behind the jewelry. Reusing grandma’s diamond, putting a special, secret message on the inside of your wedding band, copying a style from your mom’s ring, but putting a modern twist to it – these stories make the jewelry unique. Personal. Yours. And that’s what this blog is all about. The stories behind the jewelry. And boy, do we have a lot of stories! So grab a coffee and let the fun begin!